Analysing regional differences in the DNA of wood and has allowed scientists to determine the location of the original tree within 15km, and the work could help crack down on the billion-euro trade in illegal timber. Illegal logging is a serious problem, with Interpol estimating that it accounts for between 15 and 30 % of all wood traded globally. Around EUR 8-12 billion in revenue is lost annually due to illegal logging and it endangers people's livelihoods, biodiversity and food security, as well as damaging the environment by increasing carbon dioxide (CO2) emissions. Regulations have been in place since 2004 prohibiting illegally logged timber from entering the European market, but identifying illegally traded wood is difficult. At the moment, customs officers still rely on paper trails to identify imported timber. These documents can be forged by criminals, or bought illegally from corrupt officials in the territories through which contraband timber is smuggled. Authorities need global tracking systems that smugglers cannot tamper with and Prof. Zuidema is looking at a solution that uses the traceability that nature stamps deep inside the wood itself - DNA. As part of the TROFOCLIM project, funded by the EU's European Research Council (ERC), Prof. Zuidema has spent years studying the chemical composition of trees from across the tropics. The purpose of this research was to check whether excess CO2 in the atmosphere makes tropical forests grow faster. The study concluded that contrary to many expectations, it doesn't. But the vast collection of wood samples that Prof. Zuidema gathered along the way could now be used to help fight illegal logging. With additional ERC funds for a project called Timtrace, he has combed through the DNA of a tropical tree species called Tali. The tree grows in regions spanning thousands of kilometres across Africa. Like human populations, each region evolves its own familial traits and by measuring mutations in tree DNA, Prof. Zuidema can trace back Tali timber to its geographic origins. These records make it possible to verify the degree to which the DNA of timber reaching border controls is related to the specimens he has sampled in the wild. In a blind test this year, the technique identified Tali from Congo and Cameroon with an accuracy of 90 %. In some cases, geneticists narrowed down the point of origin to under 15 kilometres. This is precise enough to distinguish between legal timber logged in licensed forests and illegal timber stolen from neighbouring nature reserves. 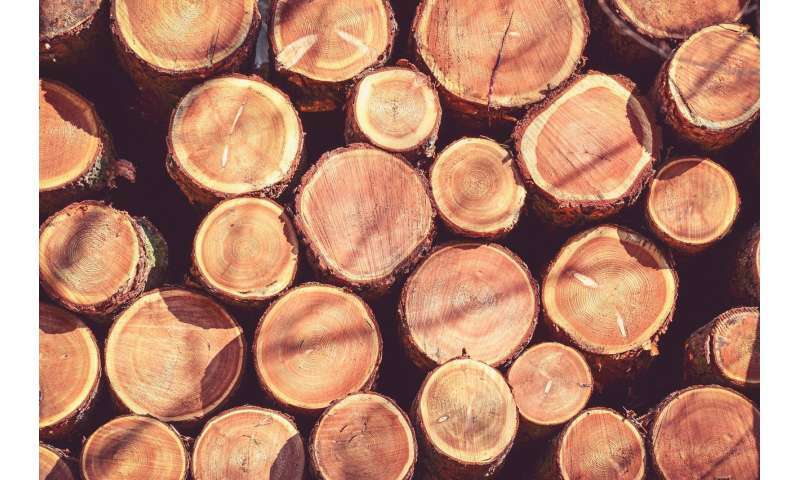 Elsewhere, scientists are working on a handheld electronic device that could trace timber almost in real time by flashing tree rings with near-infrared beams and inferring the wood's species and origin from the reflected radiation. At a recent science conference, forestry consultants from GEA Forestal in Madrid, Spain, learned that tree rings also contain data on the origin of trees. They founded the EU-funded NIRWOOD project to turn this discovery into a portable tracker to counter illegal logging. After charting out the near-infrared response of thousands of trees in different areas, they are now using the power of big data to home in on their point of origin. At present, near-infrared scanners cost upwards of EUR 40 000, but NIRWOOD is adapting their design. If they can bring prices closer to EUR 5 000, the technology could prove useful not only to law enforcement, but also to some 400 000 EU companies engaged in wood-based manufacturing that are now obliged to apply due diligence to their raw materials. Since 2003, under the Forest Law Enforcement Governance and Trade (FLEGT) action plan, the EU holds private companies accountable for any illegal wood products that they sell, which reduces demand for illegal timber and increases interest in technology that helps to determine the origin of wood. Over the coming years, NIRWOOD will upload near-infrared records from up to 120 000 trees, so that a quick check on the cloud can trace the origin of timber entering the EU in the time it takes to beep a barcode.